"PSAs are non-profit organization ads that are served to pages when targeted ads are unavailable, or when Google is unable to gather content from the page. Publishers do not receive earnings for clicks made on PSAs," mentions a page from Google AdSense's help center. I noticed a Google ad from a Romanian site that promoted Google search. 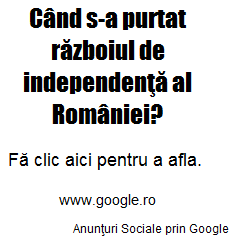 The ad linked to the Google search results for a historical question regarding the Romanian Independence War, but it was labeled as "Public Service Ad". Since when is Google a non-profit organization? It's not the first time when Google uses public service ads to promote its own services. Last year, Google promoted a special page about the US elections using public service ads. According to Wikipedia, "public service advertising is the use of commercial advertising techniques for non-commercial purposes. (...) Such advertising is generally produced and distributed on a cooperative basis by governmental agencies or nonprofit organizations acting in concert with private advertising and mass media companies. In most cases, the nonprofit provides the programming that is to be advertised, while the participating advertising agency and media companies provide creative services, media planning, and dissemination services on a pro bono basis." I remember seeing this on Brazil also, they often use their search service to provide results to 'non-profit queries', not non-profit content right away. Unafortunately Google Adsense is going to be worse every day because it's a monopoly. In My case I've NPO ads disabled, but at least 1 day every week I see that Adsense is paying nothing for some clicks. In My opinion Adsense needs a major update to repair these bugs and also give more transparency to the service.